Prime Minister Narendra Modi on Sunday slammed the Congress-led UDF for implicating former Isro scientist Nambi Narayanan in an espionage case, saying they did so “as some party leaders wanted to settle political scores”. “A few years ago, a hard working and patriotic Isro scientist Nambi Narayanan was implicated in a false case just because a few UDF leaders wanted to settle political scores,” Modi, who was in Tamil Nadu and Kerala to announce a series of projects on Sunday, said in Thrissur. 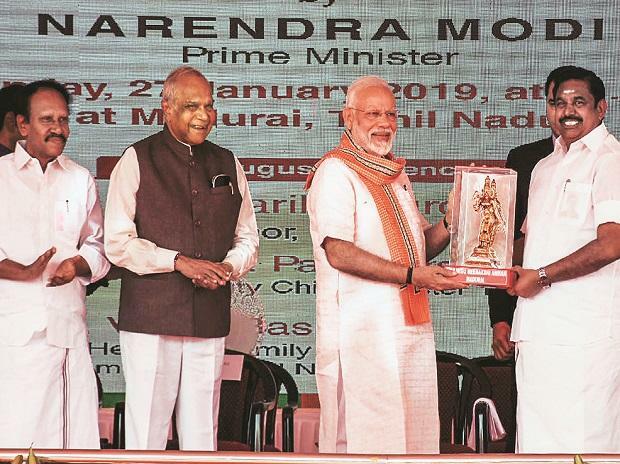 During his visit to the two states, the Prime Minister inaugurated an integrated refinery expansion complex of Bharat Petroleum Corporation at the Kochi Refinery and unveiled a foundation plaque for All India Institute of Medical Sciences (AIIMS) in Madurai. Speaking at the Kochi refinery, Modi said the NDA government had taken “decisive steps” to bring down crude oil import by 10 per cent and save precious foreign exchange for the country. Eleven oil PSUs have adopted the modern ‘lignocellulosic’ route for establishing twelve 2G ethnol plants in 11 states. “To cut down on import of crude oil, government has taken decisive steps towards reducing imports by 10 per cent and saving precious foreign exchange,” Modi said, adding that six MoUs have been signed in this direction. He said the country's refinery capacity currently stood at more than 247 MMTPA. During the day, Modi unveiled the foundation plaque for a new AIIMS in Madurai. He also inaugurated ‘super speciality’ blocks at the Rajaji Medical College in Madurai, the Thanjavur Medical College and the Tirunelveli Medical College, all in Tamil Nadu. The estimated cost for these projects is Rs 450 crore. The 750-bed AIIMS will come up at a cost of Rs 1,264-crore and is expected to begin functioning in 2022.